For other uses, see Bahia (disambiguation). Bahia (/bəˈhiːə/; locally [baˈi.ɐ])[a] is one of the 26 states of Brazil and is located in the northeastern part of the country on the Atlantic coast. 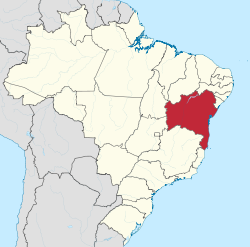 It is the 4th-largest Brazilian state by population (after São Paulo, Minas Gerais, and Rio de Janeiro) and the 5th-largest by area. Bahia's capital is the city of Salvador (formerly known as "Cidade do São Salvador da Bahia de Todos os Santos", lit. "City of Holy Saviour of All Saints Bay"), located on a spit of land separating the Bay of All Saints from the Atlantic. Once a monarchial stronghold dominated by agricultural, slaving, and ranching interests, Bahia is now a major manufacturing center whose last three elections have been dominated by the Workers' Party. The name of the state derives from the earlier captaincy of Bahia de Todos os Santos, named for Bay of All Saints (Baía de Todos os Santos in modern Portuguese), a major feature of its coastline. The bay itself was named by the explorer Amerigo Vespucci during his second voyage, when he found it on All Saints' Day (1 November), 1502. He named it after his parish church in Florence, San Salvatore di Ognissanti ("Holy Savior of All the Saints"). Over time, the bay became distinguished as the Bay of All Saints, the state as Bahia ("Bay"), and its capital first as Bahia and then finally as Salvador. Bahia is bordered on the east by the Atlantic Ocean, with its Bay of All Saints the largest in Brazil. Under the Brazilian Empire, it was bound on the north by the Rio Real and by the Jequitinhonha on the south, but Bahia now comprises an irregular shape bound by other states of Brazil, some of which were formed from it. In the north, it is now bordered (from east to west) by Sergipe, Alagoas, Pernambuco and Piauí. In the northwest, it is bordered by Tocantins. In the southwest, it borders Goiás, and in the south it is bordered (from east to west) by Espírito Santo and Minas Gerais. The state is crossed from west to east by many rivers, but the most important is the São Francisco, which starts in Minas Gerais and runs through western Bahia before emptying into the Atlantic between Sergipe and Alagoas. Formerly plied by paddlewheel steamers, the river is only navigable to small modern craft but is still vital to the arid west since it continuously supplies water during seasons when many other smaller rivers dry out. The Sobradinho Dam created one of the largest reservoirs in the world; other major hydroelectric projects along its length include the Paulo Afonso Hydroelectric Complex and the Itaparica or Luiz Gonzaga Dam. The Coconut Coast, in the north of Bahia, corresponds to a total of 193 km (120 mi) of coastline, where coconut groves, dunes, rivers, swamps and fresh water lagoons are abundant as well as the presence of the Atlantic Rain Forest. The Green Road, a road that connects Mangue Seco in the far north to Praia do Forte, crosses this region maintaining a critical distance from the areas of environmental preservation. For this reason, the route is sometimes more than 10 km (6.2 mi) from the beach. At Praia do Forte, the road meets the Coconut Road (Estrada do Côco) leading to Salvador, passing through spots, which are now integrated in the urban development of the state capital. In this region is located Deputado Luís Eduardo Magalhães International Airport. The largest bay on the Brazilian coast, the Bay of All Saints (Bahia de Todos os Santos) has a large number of islands with tropical beaches and vegetation. In its 1,052 square km, it contains 56 islands, receives fresh water from numerous rivers and creeks (especially the Paraguaçú and Subaé) and bathes the first capital of Brazil and the largest in the Northeast, Salvador, and more than ten municipalities. It is the largest navigable bay in Brazil and one of the most favorite spots for nautical sports, due to its regular breezes, medium annual temperature of 26 °C (79 °F) and sheltered waters. The bay offers various leisure options, with hundreds of vessels of all different types, especially saveiros, schooners, motor boats, jet ski that criss-cross its crystalline waters on maritime excursions to the islands, and boat races. Events and sport activities occur throughout the year, beginning on 1 January, with the Procession of Bom Jesus dos Navegantes greeting the New Year. All Saints' has also been traditionally the venue for rowing contests at the Enseada dos Tainheiros, in Salvador and now the bay is included in the routes of the great international regattas, such as the Ralley Les Iles du Soleil, regatta Hong Kong Challenge and the Expo 98 Round the World Rally, which consider the bay an important stop along the route. The islands of the bay are a separate attraction. Some are privately owned, others were declared a state heritage and transformed into Environmental Protection Areas or ecological stations. Other islands are the patrimony of 12 municipalities located around the bay. Only a few are uninhabited and many have small communities where the natives live on fishing and tourism. All have common characteristics, such a calm sea, dense vegetation, especially coconuts and bananas, as well as vestiges of the Atlantic Forest. Of the 56 islands, the most important are Itaparica, Madre de Deus, Maré, Frades, Medo, Bom Jesus dos Passos. The Dendê Coast, south of Salvador, is surrounded by verdant vegetation, clear waters, islands, bays, coral reefs and a very diversified fauna. The name of the area refers to the cultivation of the palm oil, or Elaeis guineensis, likely imported from West Africa. It is connected to Salvador and the southern part of the state by ferryboats and the BA-001 highway, the second ecological highway along the Bahian coast, which connects the southern coastline and the extreme southern part of the state. It includes the municipalities of Valença, Cairu and the International attractions of Morro de São Paulo, Camamu, Taperoá, Igrapiúna, Ituberá and Maraú. The mouth of the Rio Una, in the form of a delta, contains 26 islands, the largest of which is Ilha de Tinharé, where the Morro de São Paulo is located. At Boipeba and Cairú, which are part of the archipelago of Tinharé, the diversity of the ecosystems enables visitors to practice water sports, walk along the beach, follow trails in the rainforest and bathe on completely deserted beaches such as Garapuá. Along the southern coast of Bahia, the Cacao Coast preserves ecological sanctuaries with dozens of kilometers of beaches shaded by dense coconut groves, the Atlantic Forest, large areas of wetland vegetation and cacao plantations, the great allies in the struggle to defend the preservation of the Atlantic Forest. Walking along paths in the forest or along the beaches, horseback riding along the coast, boat trips up the vast number of rivers are some of the options that the region offers. Here one can find Environmental Protection Areas at Itacaré/Serra Grande and the Lagoa Encantada in Ilhéus, the Biological Reserve of Una and the Ecological Reserve of Prainha at Itacaré. From the Morro de Pernambuco to Canavieiras, there are 110 km (68 mi) of beaches, with reefs, inlets, coconut grove and an infinite number of estuaries of rivers which extend throughout the Cacao Coast. Highway BA-001 links the municipalities, nearly always bordering the coastline. The most important locations at Cacao Coast are: Itacaré, Ilhéus, and Olivença. The Discovery Coast preserves, virtually intact, the landscape seen by the Portuguese fleet described in the first pages of the history of Brazil. There are approximately 150 km (93 mi) of beaches, inlets, bays, cliffs, numerous rivers and streams surrounded by the verdant coconut groves, wetlands and the Atlantic Forest. Over land and sea the excursions are always associated with nature, and there are various types of water sports, walks, trips on horseback, surfing and deep sea diving. Recife de Fora, Coroa Alta and Trancoso for one day schooner excursions. BA-001 and two ferryboat systems over the Rio João de Tiba and Rio Buranhém connect the municipalities with the coast. Trips from Barra do Cai, passing through the Parque Nacional do Monte Pascoal, Caraíva, Trancoso, Arraial d'Ajuda, the environmental protection areas of Santo Antônio and Coroa Vermelha, to the mouth of the Rio João de Tiba as far as the Rio Jequitinhonha are among the various ecological trips for visitors. The Abrolhos archipelago in the extreme southern part of Bahia is an ecotourism attraction for diving and whale watching. Whales are frequent between July and November. This region contains one of the largest concentrations of fish, in terms of volume and variety, per square meter on the planet. [citation needed] There are 17 species of corals. The Whale Coast includes the municipalities of Alcobaça, Caravelas, Nova Viçosa and Mucuri and its main attraction is the Abrolhos Marine National Park. The geographical center of Bahia is the Diamantina Tableland (Chapada Diamantina) region. In this mountainous region with a diversified topography, 90% of the rivers of the Paraguaçu, Jacuípe, and Rio das Contas basins have their source here. There are thousands of kilometers of clear waters that spring from these mountains and descend in cascades and waterfalls to plateaus and plains, forming natural pools. The vegetation mixes cactus species of the caatinga dry lands with rare examples of the mountain flora, especially bromeliads, orchids and "sempre vivas" (member of the strawflower family). On the area one can find the three highest mountains in the state: Pico do Barbado, 2,080 m (6,820 ft) high, Pico Itobira, 1,970 m (6,460 ft), and Pico das Almas, 1,958 m (6,424 ft). Another scenic attraction is the Cachoeira da Fumaça ("Waterfall"), which falls 420 m (1,380 ft); the Gruta dos Brejões, the largest cavern opening of Bahia; and the Poço Encantado. There are so many natural attractions that it is possible to choose between subterranean routes in caves or trip to waterfalls, trek along old gold mining trails or follow the steps of the Prestes Column, rappel, climb mountains, or go horseback riding in the Vale do Capão or Vale do Paty in the midst of small local communities. Many of the sites are protected by the National Park of the Diamantina Tableland and the Environmental Preservation Area Serra do Barbado and Marimbus, Iraquara. There are opportunities to take long bikes and to travel on horseback, mountain bike, or off-road vehicles. Tropical. In addition to its considerable size, it has the longest coastline of the country: 1,103 km long (685 miles; north coast: 143; Bay of All Saints: 124; and southern: 418). With 68% of its territory located in the semi-arid zone, the State presents diversified climates and an average rainfall that varies from 363 to 2,000 mm (14.3 to 78.7 in) per year, depending on the region. 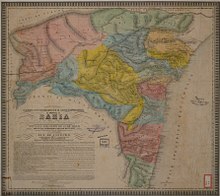 Topographical and administrative map of the Province of Bahia, 1857. São Marcelo Fort, in the capital of the state. Bahia's captaincy was the first to fail, with its lands reverting to the Portuguese crown in 1549. While Portugal was united with Spain, the Dutch East and West India companies tried to conquer Bahia but were largely defeated in the area, with Dutch Brazil restricted to Pernambuco. Bahia was a center of sugarcane cultivation from the 16th to the 18th centuries and contains a number of historic towns, such as Cachoeira, dating from this era. Integral to the sugar economy was the importation of a vast number of African slaves: more than a third of all slaves taken from Africa were sent to Brazil, mostly to be processed in Bahia before being sent to work in plantations elsewhere in the country. The state was the last area of the country to join the Empire of Brazil, as members in the local elite remained loyal to the Portuguese crown after the rest of the country proclaimed independence under Pedro I on 7 September 1822. Control of the province was disputed in several battles, mostly in Pirajá, before the Portuguese were fully expelled on 2 July 1823. Under the name Bahia Independence Day, this date vies in local importance with Brazilian Independence Day, which commemorates Pedro's 7 September proclamation. [citation needed] It became a Brazilian state in 1889. Charles Darwin visited Bahia in 1832 on his famous voyage on the Beagle. In 1835, Bahia was the site of an urban slave revolt, Malê Revolt of 1835 by the predominantly Muslim West African slaves at the time. The term malê was commonly used to refer to Muslims at the time from the Yoruba word imale . The revolt is particularly notable as the greatest slave rebellion in the history of the Americas. [citation needed] Under the Empire, Bahia returned 14 deputies to the general assembly and 7 senators; its own provincial assembly consisted of 36 members. In the 19th century, cotton, coffee, and tobacco plantations joined those for sugarcane and the discovery of diamonds in 1844 led to large influx of "washers" (garimpeiros) until the still-larger deposits in South Africa came to light. A smaller boom hit Caetité in 1872 upon the discovery of amethysts there. The cattle industry of the interior led to the development of Feira de Santana before collapsing in a series of droughts. After the end of military governments in Brazil in 1985, the state of Bahia was usually governed by PFL or PMDB. The Workers' Party achieved the governorship in 2007 and has held it ever since, in three successive elections (2006, 2010, and 2014). According to IBGE data of 2008, there were 14,561,000 people residing in the state. The population density was 24.93 inhabitants per square kilometre (64.6/sq mi). Urban population: 67.4% (2006); Population growth: 1.1% (1991–2000); Houses: 3,826,000 (2006). The last PNAD (National Census of a Sample of Households) showed the following numbers: 9,149,000 Brown (Multiracial) people (62.83%), 3,000,000 White people (20.60%), 2,328,000 Black people (15.99%), 42,000 Amerindian people (0.29%), 37,000 Asian people (0.26%). Historically, the population was estimated at 1.45 million in the 1870s and was 1.92 million at the time of the 1890 Brazilian census. The crime rate in Bahia is statistically higher than in another Brazilian states in the region and far more than the south region of the country that is considered the safest region in the nation. The state of Bahia has four of the ten most violent cities in Brazil. Gun violence in the state more than doubled in the period from 2004 to 2014, ranking 1st of the 26 states of Brazil murders. In 2014 the state of Bahia had the largest number of murderers in the country. Faculty of Law of the Federal University of Bahia. People in Bonfim Church. Religion in Bahia is a syncretic mix of European Catholicism and African religions. Nowadays, there are about 50 museums in Salvador alone, of which 25 are functioning normally. Preparing for Carnival in Salvador. As the chief locus of the early Brazilian slave trade, Bahia is considered to possess the greatest and most distinctive African imprint, in terms of culture and customs, in Brazil. These include the Yoruba-derived religious system of Candomblé, the martial art of capoeira, African-derived music such as samba (especially samba's Bahian precursor samba-de-roda), afoxé, and axé, and a cuisine with strong links to western Africa. Bahia is the birthplace of many noted Brazilian artists, writers and musicians. Among the noted musical figures born in the state are Dorival Caymmi; João Gilberto; Gilberto Gil, the former (2003–08) country's Minister of Culture; Caetano Veloso and his sister Maria Bethânia (Gil and Veloso being the founders of the Tropicália movement (a native adaptation of the hippie movement) of the late 1960s and early 1970s, which ultimate gained international recognition); Gal Costa; Luis Caldas; Sara Jane; Daniela Mercury; Ivete Sangalo; Carlinhos Brown and Margareth Menezes. The city of Salvador is also home to groups known as "blocos-afros", including Olodum, Ara Ketu, É o Tchan!, and Ilê Aiyê. Additionally, groups such as Chiclete com Banana also are based in Bahia. The first well-known rock'n roll singer in Brazil was also from Bahia. Born Raul Seixas, he was known as "Maluco Beleza" or "Peaceful Lunatic" (being "beleza (beauty)" in this manner means to be either "in peace" or "tranquil"). During the 19th century, one of Brazil's greatest poets, the Bahian abolitionist poet and playwright Castro Alves, a native of the recôncavo city of Cachoeira, penned his poem, Navio negreiro, about slavery; the poem is considered a masterpiece of Brazilian Romanticism and a central anti-slavery text. Other notable Bahian writers include playwright and screenwriter Dias Gomes, Gregório de Matos, who wrote during the 17th century and was one of the first Brazilian writers, and Fr. António Vieira, who during the colonial period was one of many authors who contributed to the expansion of the Portuguese language throughout the Brazilian territory. One of Brazil's most prominent writers of the 20th century, Jorge Amado, was born in the southeastern Bahian city of Itabuna, and resided for many years in Salvador. His major novels include Gabriela, Clove and Cinnamon; Dona Flor and Her Two Husbands; and Tieta, the Goat Girl, all of which became internationally renowned films. Other notable authors from Bahia include the fiction writers João Ubaldo Ribeiro and historic writer Euclides da Cunha, who wrote "Os Sertões". In the visual and plastic arts, one of the best known Bahian figures was the multigenre artist and Argentinian native Hector Julio Páride Bernabó, also known as Carybé (1911–1997). Fine examples of his work are visible in the Afro-Brazilian Museum in Salvador. In 2004, Bahia comprised 4.9% of the economic activity of Brazil and it has the biggest GDP of the states of the North and Northeast. The industrial sector is the largest component of GDP at 48.5%, followed by the service sector at 40.8%. Agriculture represents 10.7% of GDP (2004). Bahia exports: chemicals 22.4%, fuel 17.5%, mineral metallics 13%, paper 9.4%, cacao 5.6%, vehicles 4.8%, soybean 4.5% (2002). Bahia is the main producer and exporter of cacao in Brazil. In addition to important agricultural and industrial sectors, the state also has considerable mineral and petroleum deposits. In recent years, soy cultivation has increased substantially in the state. Bahia is the sixth largest economy in the country. During the colonial and imperial periods, Bahia was a center of Brazilian sugarcane production and slave trading. In the 19th century, the Bay of All Saints was also a whaling spot, as some species of whales used the bay as a mating ground. [citation needed] By that time, the province was also growing cotton, coffee, and tobacco with great success. Mandioc, rice, beans, and corn, saffron, oranges, mangoes, and other fruit were grown for local consumption. The arid interior was mostly used for cattle-farming, but this was ruined by a series of droughts caused in part by the custom of starting annual wildfires to improve the grass. Diamonds, gold, and amethysts were panned for in the rivers, while coal was mined on Itaparica. cacao was being farmed by the time of the First World War. As late as the mid-1950s, the Bahian economy could be considered a typical example of the primary-exporting model, which followed the subsistence production. For ten years, this dynamic was led by the cocoa crop, that used to be the state's main product and its most important source of income. With the acceleration of the industrialisation process in the 1970s, which started in the 1950s, the productive structure began to change. This process, which was not limited to the regional market, was inserted in the Brazilian industry matrix through the chemical (specially petrochemical) and metallurgical segment. Consequently, for the last twenty years, the dynamism of the Bahian economy has surpassed the national economy, yielding higher growth rates than those achieved by the national economy. The industrial sector is expected to continue to be the main contributor to this growth, particularly from 1999 on, when the investments that are being made now in the chemical, petrochemical and automotive segment, and in agroindustry and food production will be consolidated. The Bahian economy began 2005 in a very healthy state, with an exceptional trajectory of growth, once again presenting activity indicators superior to those of the Brazilian economy. Those numbers are the result of the endeavours of the Bahian Government, the result of increasing productive investment, and therefore, potential production, something that has been carried out through attractive enterprise policies in all segments of the economy, placing Bahia in a privileged position in the regional and national scenario. Today, the State has a differentiated economic profile. Bahian industry has continued to diversify and widen its productive base, with the implantation of new industrial segments, like the automobile and tyre industries, footwear and textiles, furniture, food and beverages, cosmetics and perfumes, information technology and naval development. Exceptional results can be seen in agriculture, commerce and tourism, where Bahia appears as one of the principal national destinations. For this to happen, the strategic position model of Bahia in the international tourism route was fundamental, with direct and regular flights to Europe, the United States, and the Southern Cone, due to the complementary governmental and private initiatives, besides the development of new tourist poles integrated to the local culture. Bahia's Petrochemical Pole is the largest integrated complex in the Southern Hemisphere, and is the result of R$10 billion in investments, accounting for a third of the state's exports and for nearly half of the industrial production value. Hydroelectric power plant in Sobradinho. Bahia is one of the richest states in minerals in the country, ranking third in Brazilian mineral production. The State's main products are gold, copper concentrate, magnesite, chromite, rock salt, barite, manganese, ornamental rocks, precious stones, talcum, phosphates and uranium. The Reconcavo Basin has been a principal petroleum-producing region, mainly from the Upper Jurassic and Lower Cretaceous Bahia Supergroup, since 1939 and contains the Agua Grande Field (discovered in 1951 by the Conselho Nacional de Petroleo and producing from the Sergei and Candeias Formations at about 1 km depth and the shallower Ilhas Formation), the Dom Joao Field (discovered in 1947 by the Conselho Nacional de Petroleo and producing from the Sergei Formation at a depth of about 200 m), the Miranga Field (discovered in 1965 by Petrobras producing from the Ilhas Formation at a depth of about 1 km), the Candeias Field (discovered in 1941 by Conselho Nacional de Petroleo and producing from the Candeias Formation at a depth ranging from 690–2400 m), the Buracica Field (discovered in 1959 by Petrobras and producing from the Sergi Formation at about 600 m depth), and the Taquipe Field (discovered in 1958 by Petrobras and producing from the Ilhas Formation). In Bahia, the automotive sector has gained prominence since the creation of the Northeast Ford Complex in Camaçari (2001), and has become one of the most promising sectors of the Bahian economy. This enterprise, which was developed with the aim of generating 5,000 direct jobs and 55,000 indirect ones in 2005 has surpassed those expectations by creating 8,500 direct job positions and 85,000 indirect ones since its development. Nowadays, Bahia produces about 10% of all vehicles produced in Brazil, occupying the third position in the national rankings. The Bahian automotive sector, led by Ford was in 2005 the third largest contributor (14.6%) to the Bahian GDP. It is important to highlight that Bahia had a 4.8% overall increase in its GDP, double the national performance, according to the Superintendency of Economic and Social Studies of Bahia (SEI)/Secretariat of Planning and IBGE. Agribusiness; Footwear; Call Centers; Informatics, Electronics, and Telecommunications; Nautical; Paper and Pulp; Textiles; Plastic Transformation; and Tourism. The State of Bahia has been assigning a significant part of its revenues to public investments. The investment programs of the state have been backed basically by its own resources and, in a complementary fashion, with resources originating from credit operations signed with international organizations (World Bank, IDB, KFW, OECF, etc. ), and with national creditors (CEF, BNDES, etc.). There are governmental investments in progress in the fields of environmental and urban sanitation (Bahia Azul), popular housing (Viver Melhor), transportation (Corredores Rodoviários), tourism (Prodetur), urban development (Produr), and regional development (Sertão Forte). The airports of the State received special attention from the Government, with the development of a systematic program of reforms and improvements of the small airports of the interior, and, simultaneously, with the construction and/or improvements of the airports of the regions with some tourist appeal. Some distinction must be given in this work, for instance, to the construction of the airports of Piritiba and Mimoso do Oeste, in Barreiras region, both finished by now. To the landing runway and marshalling yard enlargements of the Porto Seguro Airport, enabling it to receive large aircraft like the 767-400 Boeing. To the construction (in progress) of two new airports in the interior: one in Valença, near Morro de São Paulo, and the other in Lençóis, in the Diamantina Tableland region; also to some repairs and improvements of the airports of Jequié, Irecê, Barreiras, Feira de Santana and Esplanada, among many others. State University of Bahia in Caetité. The Government policy for transportation, has emphasized the integration of different transportation systems aiming to facilitate the flow of production, to reduce costs and to increase the competitiveness of the Bahian economy. For this purpose, the Government has conceived and is already implementing the "Corredor Intermodal de Transporte" (an intermodal transportation system), situated in the São Francisco River, that combines in one system waterways, roads and a railway. The system connects all the sailable part of the river (1,371 km (852 mi) within the State) to many roads and to one railroad, the "Centro Atlântica". This system conducts to the Salvador and Aratu ports all the economic production of the West and São Francisco regions, at a reduced cost. Social areas have also been given priority by current and previous administrations. The construction of new teaching facilities, the set up of a training and career development center for teachers, as well as new hospitals and health centers, and the acquisition of equipment and the modernization of the civil and military police are examples of this Government's action. The significant increase in the amount of investments in the year 1997 is explained by the success of the state privatization program, confirming the purpose of the government in intensifying public development projects throughout the state. The State of Bahia has the best Human Development Index of Northeastern Brazil. The Fundação de Amparo à Pesquisa do Estado da Bahia (FAPESB) is an organization of the Bahia, Brazil, government devoted to funding of science and technology in the state. Deputado Luís Eduardo Magalhães International Airport (SSA). Deputado Luís Eduardo Magalhães International Airport is located in an area of more than 6 million square meters (1,500 acres) between sand dunes and native vegetation. The road route to the airport has already become one of the city's main scenic attractions. It lies 20 km (12 mi) north of downtown Salvador. In 2007, the airport handled 5,920,573 passengers and 91,043 aircraft movements, making it the fifth busiest airport in Brazil in terms of passengers. The airport's use has been growing at an average of 14% a year and now is responsible for more than 30% of passenger movement in northeastern Brazil. Nearly 35,000 people circulate daily through the passenger terminal. The airport generates more than 16,000 direct and indirect jobs, to serve a daily average of over 10,000 passengers, 250 takeoffs and landings of 100 domestic and 16 international flights. There are good cafes and fast food restaurants at the airport. A bar offers alcoholic or soft drinks. There are several shops in the terminal building selling items, including fashion clothing, jewellery, gifts, and books and magazines. There is a pharmacy in the terminal building. Buses between the city centre and the airport are fairly frequent. The Praça da Sé (Sé Square)/Aeroporto bus is much cheaper than going by taxi. Buses also go to Rodoviária, the city's main bus station, 5 km (3.1 mi) from the city centre. The car park of the airport is located near the terminal building and has spaces for 600 cars. The international airlines are Lufthansa, TAP, United Airlines, American Airlines, Alitália, Air France, Air Europa, Ibéria, Aerolíneas Argentinas, LanChile. In addition to domestic and regional services, the airport has non-stop flights to Lisbon, Madrid, Frankfurt, Montevideo, London, Santiago, Buenos Aires, Asunción and Miami. Its IATA airport code is SSA and it is the sixth busiest airport in the country, the first in northeastern Brazil, behind Congonhas International, Guarulhos International, Juscelino Kubitschek International, Santos Dumont Regional and Galeão International. BA- 001, BR-101, BR-116, BR-242, BR-251, BR-324, BR-342, BR-367, BR-407, BR-418, BR-420, BR-445, BR-498. Bahia's government is also inaugurating a large portion of the BA 001 between Morro de São Paulo and Itacare. The constructions began in September 2006 and were scheduled to finish mid-2009. That portion of the highway will allow travellers to save up to two hours on a trip from Salvador to Ilheus or Itacare. It was a controversial part of the constructions since a small portion of native rain forest had to be destroyed. However, the IBAMA (Brazilian Institute of Environment and Renewable Natural Resources) followed closely the development of the road and the harm to the forest was minimal. The new part of the BA 001 will benefit thousands of families that live near the highway will be benefited with transportation, schools and will exponentially enhance tourism in Itacare, Camamu and Ilheus. With cargo volume that grows year after year following the same economic development rhythm implemented in the State, the Port of Salvador, located on the Bay of All Saints, holds status as the port with the highest movement of containers of the North/Northeast and the second-leading fruit exporter in Brazil. The port's facilities operate from 8am to noon and from 1h30am to 5h30pm. The ability to handle high shipping volume has positioned the port of Salvador for new investments in technological modernization, and the port is noted for implementing a high level of operational flexibility and competitive rates. The goal of port officials is to offer the necessary infrastructure for the movement of goods, while simultaneously meeting the needs of international importers and exporters. Football is the most popular sport. The two most popular football teams are Esporte Clube Bahia and Esporte Clube Vitoria. In 2013, Bahia and Vitoria play in the Brazilian Championship Serie A (first division/premier league). Bahia has won the two most important football national league: The Taça Brasil in 1959 and the Brazilian Championship Serie A (Campeonato Brasileiro) in 1988. Vitoria has never been a national champion but was runner up of the Brazilian Serie A in 1993. Bahia is renowned for its mixed martial arts fans, with prominent fighters from this state including former heavyweight champion of both Pride Fighting Championship and Ultimate Fighting Championship Antônio Rodrigo Nogueira, his twin brother Antônio Rogério Nogueira, and former Ultimate Fighting Championship Heavyweight Champion Junior dos Santos. In the sport of boxing, Bahian native Acelino Freitas has won the WBC belt in the lightweight class. In the Capoeira world, the actor and Capoeira Master, Lateef Crowder dos Santos is an American born in Salvador, Bahia. Salvador was one of the host cities of the 2014 FIFA World Cup, for which Brazil was the host nation. The flag was officially adopted on 11 June 1960. The Bahian flag is influenced by the flag of the United States, as well as colors and symbolism from the 1789 separatist movement of Inconfidência Mineira and the 1798 Bahian slave rebellion of the Revolt of the Tailors. ^ The common Brazilian Portuguese pronunciation is [bɐˈiˑ.jɐ]. In European Portuguese the pronunciation is [bɐˈi.ɐ]. The h is not pronounced: its purpose in Portuguese orthography is to indicate that the stress is on the i (otherwise, it would be the semivowel /j/, as the English letter y when representing a consonant, and the stress should be in the ba). ^ "Instituto Brasileiro de Geografia e Estatística". IBGE. 2012-08-31. Archived from the original on 22 July 2014. Retrieved 3 April 2017. ^ a b c d e f g h i EB (1878). ^ Goh, KJ; Wong, C.K. ; Ng, P.H.C. (2017). "Oil Palm": 382–390. doi:10.1016/B978-0-12-394807-6.00176-3. ^ a b c d e f EB (1911). ^ Sistema IBGE de Recuperação Automática - SIDRA (PDF) (in Portuguese). Bahia, Brazil: IBGE. 2008. ISBN 85-240-3919-1. Archived from the original on 2011-06-14. Retrieved 2013-07-08. ^ "Os estados mais e menos perigosos do Brasil | EXAME.com - Negócios, economia, tecnologia e carreira". Exame.abril.com.br. Archived from the original on 5 March 2017. Retrieved 3 April 2017. ^ "Quatro dos 10 municípios mais violentos do país estăo na Bahia". Tribunadabahia.com.br. Archived from the original on 11 November 2016. Retrieved 3 April 2017. ^ "Bahia lidera número de assassinatos no Brasil, indica pesquisa divulgada pelo Ministério da Justiça - R7 Brasil". Notícias (in Portuguese). 15 October 2015. Retrieved 3 April 2017. ^ "ESTIMATIVAS DA POPULAÇÃO RESIDENTE NO BRASIL E UNIDADES DA FEDERAÇÃO COM DATA DE REFERÊNCIA EM 1º DE JULHO DE 2014" (PDF) (in Portuguese). Instituto Brasileiro de Geografia e Estatística (IBGE). 28 August 2014. Retrieved 3 September 2014. ^ Collins, John (2015). Revolt of the Saints: Memory and Redemption in the Twilight of Brazilian Racial Democracy. Durham: Duke University Press. pp. 1–43, 181–214. ISBN 9780822353065. ^ Ghignone, J.I., and Andrade, G.D., General Geology and Major Oil Fields of Reconcavo Basin, Brazil, in Geology of Giant Petroleum Fields, Halbouty, M.T., editor, AAPG Memoir 14, Tulsa:American Association of Petroleum Geologists, 1970, pp. 337-358. ^ "Airport statistics for 2007 (Infraero) - Deputado Luís Eduardo Magalhães International Airport" (PDF). infraero.gov.br. Archived (PDF) from the original on 16 February 2008. Retrieved 1 May 2018. ^ "Bandeira da Bahia" [Flag of Bahia] (in Portuguese). Archived from the original on 18 March 2017. Retrieved 17 March 2017. Wikimedia Commons has media related to Bahia. Wikivoyage has a travel guide for Bahia. Collins, John F. (2015), Revolt of the Saints: Memory and Redemption in the Twilight of Brazilian Racial Democracy, Durham: Duke University Press: describes the hotly contested restoration of the Pelourinho, or Salvador, Bahia's colonial city center that is today a UNESCO World Heritage Site, and links these changes to racial politics in Brazil today. Romo, Anadelia A. (2010), Brazil's Living Museum: Race, Reform, and Tradition in Bahia, Chapel Hill: University of North Carolina Press : covers the period from the abolition of slavery in 1888 to the start of Brazil's military regime in 1964.